Are you mindful of airborne contamination when specifying vinyl flooring for high risk clinical areas? As people spend time in a healthcare environment to get better, the importance of good air quality inside healthcare buildings is being increasingly recognised. In fact, this extends to well-being in general, as all materials emit Volatile Organic Compounds (VOCs) into the atmosphere, which can easily become vapours and gases, making the air we breathe potentially harmful. 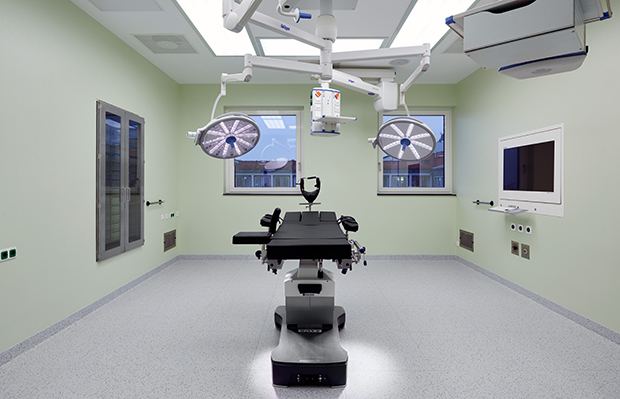 It is therefore not enough that floorings in the clinical environment only address cleanability and the harbouring of nosocomial infection as the need for superior air quality is also vital. Specifying vinyl flooring that eliminates the worry of ‘nasties’ being released by products under everyday use will undoubtedly bring peace of mind to healthcare establishments but it could also help you, as specifiers, to breathe more easily. The impact of air quality by particulate and molecular emissions inside buildings can be negative to health and well-being, especially where people are being treated in high risk areas. To create a cleanroom, pollutants like VOCs and airborne particles should have low and controlled levels. The European standards ISO 14644 for cleanrooms in general and ISO 14698 for where bio-contamination can occur, define cleanliness classes of particulate, molecular and micro-organisms. ISO 14644-1 states the acceptable number and size of particles per cubic metre for an area to be deemed clean. Particulate cleanliness classes range from ISO 1, the most demanding, to ISO 9, the least demanding. What is a ‘high risk zone’ and how much airborne contamination can be tolerated? The French standard, NF S90-351, refers to the European standards ISO 14644 and ISO 14698 concerning hygienic air processing. The standard cites examples of a ‘high-risk’ zone (Zone 3) as post-transplant units, interventional radiology areas, or multi-purpose zones within operating theatres. Examples of Zone 4, or ‘very high risk’ zones are hospitalisation areas for burns, haematology patients, or operating theatres for organ transplant. Zone 4 areas require an ISO Class 5 performance level, and for a flooring or wall covering to achieve ISO Class 5, the concentration of 0.1um-sized particles in the air must not exceed 10,000 particles per m3. Some vinyl floor and wall coverings exceed these requirements and have also achieved ISO Class 4 providing added reassurance. How can manufacturers provide peace of mind for high risk zone specifications? The key role that flooring and wall coverings play in these environments, and the sector-specific innovation and expertise that exists, need to be communicated effectively. Designed-for-purpose, hard-wearing, polyurethane-treated floors and walls will increase prevention against micro scratches, reducing airborne contaminants. Designed-for-purpose products, plus a commitment to product testing to the most stringent international standards, will produce results that provide reassurance by not just meeting, but exceeding, requirements (ISO4 and ISO5). For more information on ULTRA CLEAN’s role in high risk clinical environments, please contact Amanda Hickman by calling 01926 622 600, emailing contractuk@gerflor.com, or visiting gerflor.co.uk for the latest innovations.